After a lot of hype and anticipation, Huawei’s subsidiary, Honor has launched the V20 flagship smartphone at an event held in China today. The smartphone will later be launched as Honor View 20 in Paris on January 22nd. Amongst other things, the V20 or View 20 is the first from the brand to come with a punch-hole display for selfie camera joining the rare breed of devices that have come up with such an innovative solution to offer a high screen-to-body ratio. If you are wondering what else does the smartphone brings to the table, read on ahead. As glass and metal construction go mainstream, the onus is upon the brands to stick to the trend and yet do something different. We have already seen brands bringing gradient hues, two-tone glass finish and soft satin finish on their smartphones. However, with the V20, Honor has taken a different route. The latest offering continues with a glass-sandwich design, but it reflects a cascading V-shaped pattern when tilted up and down in the light. The handset does look enticing and can turn heads wherever it goes. In the last year, we have seen displays go from tall (18:9) to even taller (19:9) with the help of display notches and moving components of varying shapes and sizes. However, the next wave of display technology has started pouring in and screens with a punch hole seems to be one of the most popular ways forward. 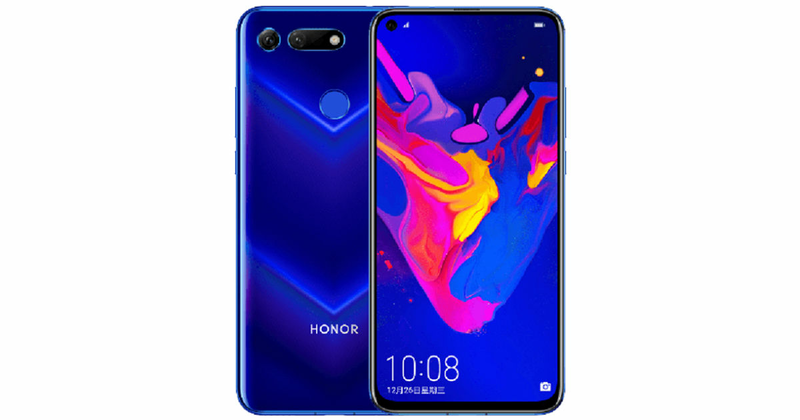 The Honor V20 is one of the first few (after the Samsung Galaxy A8s and Huawei Nova 4) to come with a punch-hole display. At the launch event, Honor went to great lengths to highlight that the hole has been combined within the layers of the LCD itself, rather than just being drilled into the panel. Honor has also used a smaller aperture for a 25-megapixel front shooter to take up less space on the display. This whole arrangement has resulted in a thinner construction and a tightly-integrated selfie shooter, which means a lot less light bleed around the edges of the camera. The display measures 6.4-inches and offers a screen resolution of 2,310 x 1,080 pixels and unusually tall aspect ratio of 19.25:9. If the front camera raises your eyebrows, the rear camera is no less. The rear panel of the smartphone is home to an industry-leading 48MP Sony IMX586 CMOS sensor accompanied by a 3D ToF sensor. While the size of the sensor means that actual pixel size (0.8 µm) is quite small and take in a lot less light, Honor has made use of Quad-Bayer array that fuses the light data from four adjoining pixels to create a more detailed image. Further, the 3D ToF (Time of flight) sensor is designed to capture real-world objects and create 3D animated characters. The sensor also facilitates 3D body shaping with assistance from the Hisilicon Kirin 980 SoC, to produce close-to-perfect full-body shots. Speaking of the Kirin 980 SoC, the Honor V20 gets the top-notch specifications. The 7nm SoC features eight cores with a clock speed of up to 2.6GHz and is backed by 6GB / 8GB RAM. Depending upon the variant you go for, the device ships with 128GB or 256GB storage. The V20 also gets the second-generation GPU Turbo 2.0 technology, which assists in boosting performance and graphics during gaming sessions. To keep the handset cool during long gaming sessions, Honor has also placed a liquid cooling system in place. Another interesting feature of the device is what the brand is calling Link Turbo, which basically combines cellular and Wi-Fi networks to boost the download speeds. The fact that a smartphone as loaded as Honor V20 with an all-screen fascia and a loaded spec sheet will be a battery hogger wasn’t lost on the manufacturer. Honor has equipped the latest offering with a massive 4,000mAh battery with support for 22.5W SuperCharge. The brand claims that the fast charging tech can juice up the device by up to 55 percent levels in just 30 minutes. By now it should not come as a surprise that the Honor V20 is definitely a great contender from the Chinese brand. We will bring you more updates on January 22nd when the smartphone goes official globally, so stay tuned.